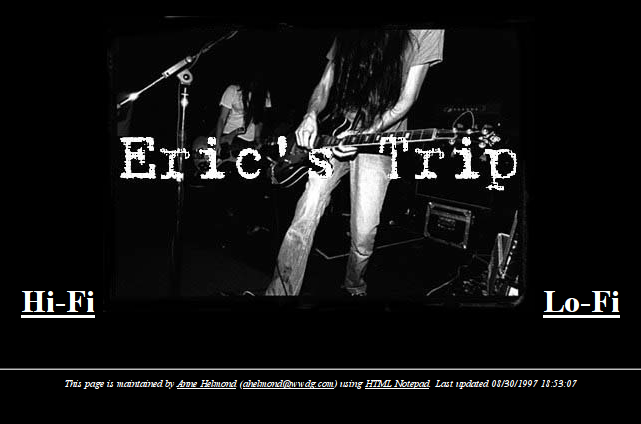 New Media researcher Anne Helmond asked if her 1997 “Unofficial Eric’s Trip Homepage” at SunsetStrip/3500/ was archived. It is there. The lo-fi (html) part is almost complete and functional, only guest book and “Sounds” are missing. Hi-Fi link leads to a non existing ethi.html. As I mentioned in Ruins and Templates of Geocities, we rarely know whether missing files were lost due to glitches during the archiving process, or to the site owner’s lack of skill or failure to maintain the files and links between them. But this time I could ask the user personally what was there. Anne said that probably she never ever made a HiFi version and can’t remember what she planned for this. It is so 1997! I remember myself believing that broadband is just some weeks away and preparing for the nearest future with links like that. This can be it. Broken links were links to the files to be made very very soon. I like your take on the missing “hifi” part as a way of webmaster’s anticipating future technologies, or, wanting to engage with new technologies but never actually getting around to do so. I also noticed that the lofi index, or actually the front page, states that this page is best viewed in Netscape (where I assume Netscape Navigator or Netscape Navigator Gold) and that the link to the “optimized for Internet Explorer” link is actualy broken.